Background: The use of rubber dam (RD) has been recommended in dental procedures including root canal treatment. The aim of the study was to identify factors that were associated with patients' satisfaction and acceptance of RD. Setting and Design: This was a cross-sectional study, conducted from January 2015 to December 2016 at Kuwait University School of Dentistry. Materials and Methods: A pretested questionnaire was used by a face-to-face interview of patients after taking informed consent. The study was approved by the Institutional Ethics Review Board. The providers/operators who applied RD were grouped into three categories: undergraduate final year (7th year) dental students; general dentists and postgraduate students; and specialists. Results: Mean age of the patients (n = 175) was 31.6 ± 13.0 years. About 55% had past experience, and 52% expressed a better experience during the current procedure compared with the previous one. A positive experience during the current procedure correlated significantly with the future intention of RD use (r = 0.244, P = 0.001). Time needed for RD application was short (4 min), irrespective of the operators. The duration of RD use during the procedure was significantly shorter among dental specialists compared with the other groups. Time for RD application was the only significant predictor for patient satisfaction, after controlling for other independent variables. Conclusion: Based on the positive influence of current RD use on the future intention, dentists should spend time needed to explain the importance, safety and effectiveness of RD use with their patients. A dental dam or rubber dam (RD) is a thin, 6-inch (150 mm) square sheet, usually latex or nitrile, used in dentistry to isolate the operative site from the rest of the mouth. The use of RD in dentistry in general and endodontics in particular has many advantages, including control of cross-infection,, protection of the patient by preventing inhalation or aspiration of instruments or materials used during dental procedures, protection of the operator from legal responsibility, and improving treatment efficiency. It is well known the role of microorganisms in causing root canal infection and the importance of microorganism elimination of the root canal system for successful root canal treatment. The use of an RD during prefabricated postplacement procedure provides a significantly higher success rate of root canal-treatment. Abbott found that the most common factor associated with continuing pain in root canal treatment was lack of use of RD. The use of RD is considered the standard of care by professional organizations.,, The American Association of Endodontics advised for tooth isolation using the dental dam as an integral and essential part of any nonsurgical endodontic treatment. The Australian Dental Association also recommended for the use of RD, where possible, for restorative work to reduce exposure of dental practitioners and clinical support staff to potentially infected aerosols. Similarly, the European Endodontic Association recommended the use of RD in endodontic treatment. In spite of many advantages of RD use and the recommendations, studies have shown a low prevalence of RD use by dentists, varying from 6.6% to 60%. In Sweden, more than 90% of the general dental practitioners (GDPs) reported the use of RD routinely, while in Taiwan the prevalence of RD use by general dentists was as low as 16%. Many reasons have been reported for not using RD. The most commonly reported reasons include lack of patient acceptance, time required for the application, insufficient training of the provider, difficulty in use, and the cost of equipment and materials. These attitudes explain why there is substantial discordance between the presumed standard of care and actual practice. However, there are gaps in the literature on the relationship between provider type (the operator) and their training with patients' attitude toward acceptance of RD. 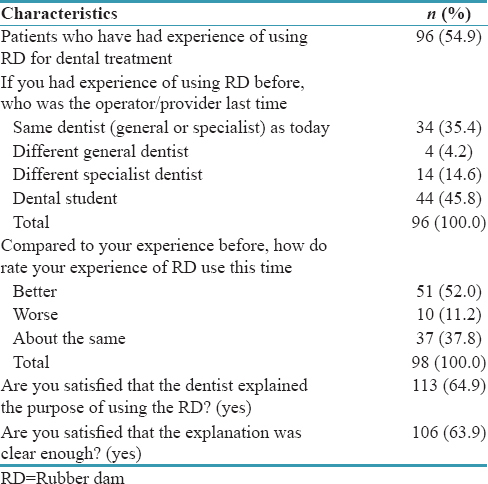 In this study, the investigators aimed to (1) identify differences in procedure time for using RD and the dental treatment of root canal among the providers; and (2) demonstrate if the procedure time, in addition to patients' demographics, past experience of using RD, and provider type can predict patients' satisfaction for using RD. The study was conducted at the Kuwait University School of Dentistry from January 2015 to December 2016. At Kuwait University, the use of RD is taught to the dentistry students, and it is mandatory to use RD for all cases for root canal treatments as well as for other operative procedures. The conventional RD technique is used by applying the rubber sheet and the clamp first and then using the frame. Single tooth isolation is used in root canal treatment cases while multiple teeth isolation (quadrant isolation) is used for operative procedures. A questionnaire was designed and the content validity of the questionnaire was done using the data obtained from several studies., The questionnaire included 15 questions divided into three sections:First, patients' demographic information, previous experience of using RD, level of satisfaction of RD use for the current procedure, whether the procedure of RD was explained clearly to him/her or not, and his/her attitude toward using RD in the future; second, the operator (provider) information such as categories of the provider which included undergraduate final year students, postgraduate students, general dentists, endodontists, or other dental specialists; and thirdly, clinical information, such as the time (minute) required to apply RD, and the time (minute) required to complete the dental procedure. The questionnaire was pretested among ten people who were not included in the study. All the operators were previously trained on the use of RD by formal classroom lectures and by hands-on training for several months before the study. The study was approved by the Health Science Center Ethics Review Board. An informed consent was obtained from each patient before they were enrolled in the study. The operators distributed the questionnaire to their patients after they were discussed about the use of RD and the dental procedure. The operators recorded the time required for the application of RD and the procedure of root canal surgery for each patient. Once the root canal procedure was complete, the principal investigator (MM) introduced the questionnaire and collected the information from the patient by a face-to-face interview. Data were entered, cleaned, and analyzed using statistical package for the social sciences (SPSS version 23 software, Armonk, NY: IBM Corp). Descriptive data were computed and assessed for the distribution. The providers/operators who applied RD and conducted the dental procedures were grouped into three categories: (1) undergraduate final year (7th year) dental students; (2) general dentists and postgraduate students; and (3) specialists including endodontists. Age of the patients was collected as a continuous variable and subsequently categorized into three groups: young children (≤15 years), adults (16–54 years), and older age group (≥55 years). Most of the variables such as attitude, past experience, preference for RD, benefits of using RD, and current feeling of using RD being categorical, Chi-Square tests were performed to assess the association between acceptance or attitudes toward RD and the demographics of the patient, and the provider/operator categories. Pearson correlation test was used to assess bivariate associations between the major variables of interest. Time (minute) needed for the application of RD and duration of RD use were compared among the operators/providers using one-way ANOVA test or Kruskal-Wallis test, depending on the distribution of the data. A Tukey's HSD test was used for multiple comparison. A multiple logistic regression test was done to find out the predictor variables for the patient satisfaction of RD use. A P ≤ 0.05 was considered statistically significant. Data were obtained from 177 patients, of which two were excluded due to incomplete data. The age of the patients (n = 175) ranged from 11 to 65 years, with a mean ± standard deviation (SD) of 31.5 ± 13.0 years. The distribution of the patients by age categories was as follows: ≤15 years– 12 (6.9%), 16–54 years– 153 (87.4%), and ≥55 years– 10 (5.7%). The majority of patients were females (n = 95, 54.3%). Among the provider/operator categories, general dentists, specialists, and postgraduate dental students combined comprised over 54% [Table 1]. Almost, half of the patients (n = 96, 54.9%) had past experience of using RD [Table 2]. Of those who had previous experience, more than 50% expressed that they had a better experience in using RD during the current procedure compared to the past. Also, more than 60% of the patients expressed satisfaction toward the operator/provider who explained clearly the reason for the use of RD. The majority of the patients (69.4%) mentioned correctly that both dentists and the patients are benefited from the use of RD in dental procedures [Table 3]. Almost, a similar number of patients admitted a pleasant or comfortable experience of using RD. Moreover, the majority of the patients expressed a preference for using RD in a future procedure. The future intent of using RD correlated significantly with a positive (pleasant or comfort) experience for the current procedure (r = 0.244, P = 0.001). The average time needed for the application of RD was only about 4 min. The mean ± SD time taken by students to apply RD was 4.08 ± 3.42 min, with a range of (0.5–15 min). For the general dentists, mean application time was 4.12 ± 4.77 min, with a range of (0.33–30 min). For the specialist, the mean time was 4.77 ± 6.79 min, with a range (0.5–30 min) [Table 4]. The application time for RD did not differ significantly among the provider groups (P = 0.116 for Kruskal-Wallis test). However, the duration of RD application for the root canal treatment procedure varied among the providers. The mean duration of RD use for the dental procedure was 95 min (10–130 min) by undergraduate students, 86 min (10–180 min) by general dentists, and 61 min (25–120 min) by a specialist [Table 5]. In a Tukey's post hoc test, the time needed by endodontists and other dental specialists was significantly shorter compared with the general dentists (mean difference, 24.9 min, P = 0.002), and with the dentistry students (mean difference, 34.0 min, P < 0.001) [Table 5]. The differences in time needed for the application of RD and the dental procedure by provider categories are shown in [Figure 1]. Further analyses were done to explore any association between people's demographic characteristics with their satisfaction of using RD. Overall, male patients had a 10% lead in their level of comfort compared to their female counterparts (61% vs. 51%, P = 0.47). A higher proportion (70%) of older age group patients expressed comfort with the RD procedure, whereas only 55% of the middle age group patients and 42% of the younger group of patients felt comfortable with the procedure (P = 0.68). 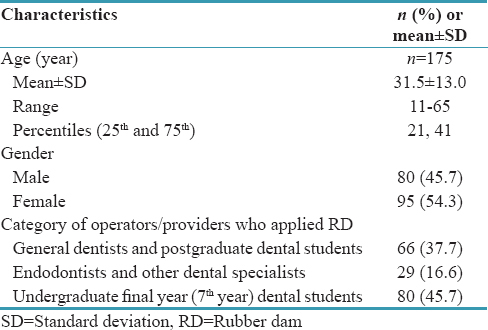 Again, patients who underwent the RD application by endodontists had more pleasant experience (13.8%) compared with those who were treated by the general dentists (6%) and by the undergraduate final year students (5%) (P = 0.83). In a multivariate logistic regression analysis, patients' satisfaction of RD use (satisfied = 1, not satisfied = 0) was used as the dependent variable, and a number of independent variables including age group, gender, past experience of using RD, provider type, time needed for using RD, and time needed for the dental procedure were used in the model. Only time for the RD procedure was significantly associated with satisfaction (P = 0.04), with a β-value of-0.086, after controlling for all other variables in the model. The negative β-value suggests that less the time required for the RD procedure more were the patients satisfied. This study demonstrated factors associated with patients' satisfaction of using RD during root canal treatment. Several factors including past experience of the patient, a clear information about the purpose of using RD, a pleasant or comfortable experience of RD use, operator qualification, shorter application time for RD, and duration of the procedure were associated with patients' satisfaction. However, duration of RD application for the root canal procedure was the only significant factor predicting patients' satisfaction, after controlling for the other associated factors in a multivariate analysis. As identified in earlier studies, one of the reasons for low prevalence of RD use was lack of patient compliance. However, in this study, the majority of patients (61.2%) reported the use of RD as comfortable and/or pleasant. A similar proportion of patients also expressed their future intent to use RD. In our study, the preference for RD usage in the future was significantly associated with the patient acceptance and comfort in the current session. This is in agreement with Stewardson and McHugh, who found a statistically significant association between preference for RD use next time and current positive experience of RD for patients treated by either students or dentists. Also, Kapitan et al. found that the preference for the future RD usage was significantly affected by the level of comfort during the treatment with RD. In Croatia, 58% of the patients were comfortable to wear RD, and 69% indicated that they would use it in the future, whereas a higher proportion of Czech dental patients were comfortable (77%) and would prefer for the future use of RD (86%). 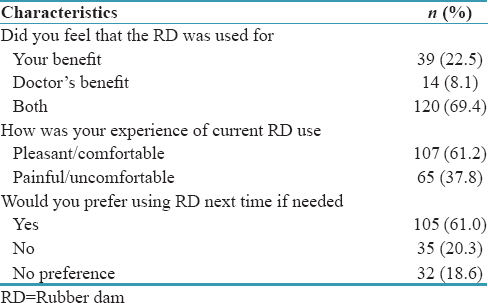 For almost half of the patients (45.3%), this was their first experience with RD. These results are similar to the study of Stewardson and McHugh  and may indicate the low level of RD usage by dental practitioners. A slightly higher percentage of male patients in our study reported the RD use to be comfortable, whereas Stewardson and McHugh  found that among patients treated by dentists a significantly greater percentage of females indicated preference for RD use than males. Furthermore, a greater number of older age group of patients expressed comfort with RD use in our study. It is possible that the older patients had a higher pain threshold than the younger patients, as observed in other studies. 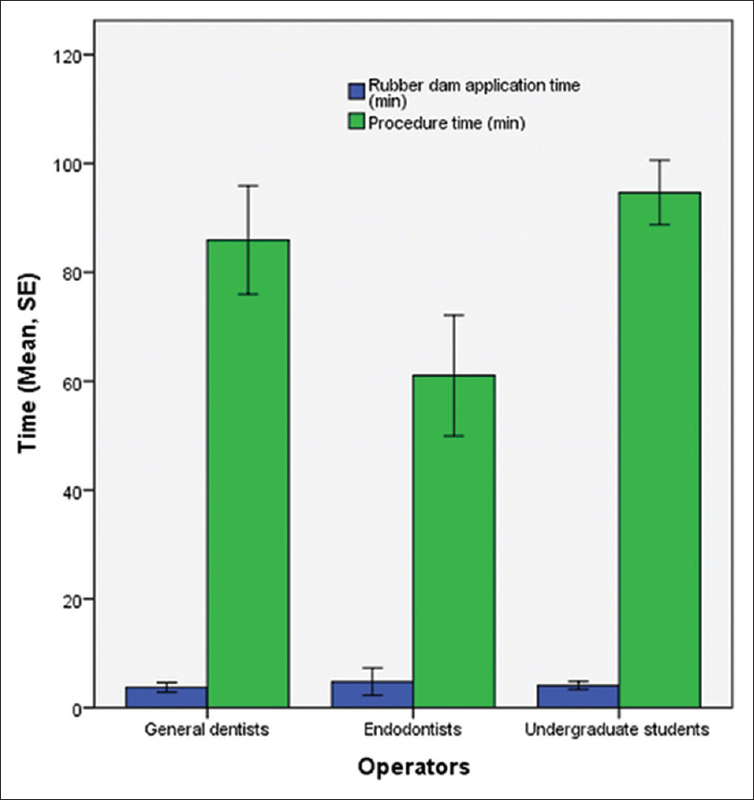 This study included patients treated by either general dentists, endodontists, or undergraduate students, in an attempt to find out if the operator qualification and experience influence patients' acceptance. More patients treated with endodontists described the RD experience as pleasant, as compared to the other groups. In addition, the duration of RD application for the root canal procedure was shorter among the dental specialists, compared with general dentists and dental students. Several other studies also compared treatment outcomes among patients treated by final year dental students, resident dentists, GDPs, and dental specialists., Stewardson and McHugh  reported a shorter duration of RD use among the experienced dentists compared with dentistry students. Another study found a statistically significant difference in the future use of RD between patients treated by a specialist or a student. Interestingly, the time needed for the application of RD was similar and short (mean of 4.0 min) among the operators. A little longer application time for the specialists, although not statistically significant, could be explained by the difficulty level of the procedures handled by the specialists. More importantly, this study showed that final year students could be effectively trained to use RD in endodontic treatment. More than half of the patients in this study were treated by the 7th year dental students. In Kuwait University, the dentistry students receive hands-on training on the use of RD starting from the 5th year of their education. The use of RD is mandatory in Endodontics and Operative simulation laboratories, done under close supervision of instructors in this School of Dentistry. Later, students are required to apply this technique during their practical training in the clinics. They receive training on single tooth isolation, conventional RD technique for root canal treatment and quadrant teeth isolation for operative cases. The extensive training that undergraduate students receive could have been the reason that there was no statistically significant difference between the operators in respect to the time of RD application, patients' comfort, and patients' preference for RD use. One of the limitations of this study was that this was not a randomized controlled trial (RCT). Since the use of RD is considered a standard of care in root canal treatment in most countries, and that it is mandatory to use RD in root canal treatment and other operative procedures in Kuwait, it was unethical to use an alternative treatment procedure for an RCT design. A high patient acceptance of RD and their willingness to use it in the future indicate the importance of it to explain and educate the patients during dental appointments which may influence compliance. Second, this study did not include data on the experience of the providers and the frequency of RD use. This study demonstrated factors which are associated with patients' satisfaction of RD use. It also showed evidence that although the duration of the RD use was significantly shorter among specialists, the application time of rubber time was short and similar in all the providers including dental students. A rigorous training and mandatory use of RD in root canal treatment and other surgical procedures could be effective in the use of RD among providers.,, Further studies are needed with larger sample size and may include data on other dental procedures. Cochran MA, Miller CH, Sheldrake MA. The efficacy of the rubber dam as a barrier to the spread of microorganisms during dental treatment. J Am Dent Assoc 1989;119:141-4. Glickman GM, Pettiette MT. Preparation for treatment. In: Cohen S, Hargreaves KM, Keiser K, editors. Pathways of the Pulp. 9th ed. St. Louis, MO: Mosby; 2006. p. 120-32. Peters OA, Peters FC. Ethical principles and considerations in endodontic treatment. Endo Endod Pract Today 2007;1:1-8. Bhuva B, Chong BS, Patel S. Rubber dam in clinical practice. Endo Endod Pract Today 2008;2:131-41. Goldfein J, Speirs C, Finkelman M, Amato R. Rubber dam use during post placement influences the success of root canal-treated teeth. J Endod 2013;39:1481-4. Abbott PV. Factors associated with continuing pain in endodontics. Aust Dent J 1994;39:157-61. European Society of Endodontology. Quality guidelines for endodontic treatment: Consensus report of the European Society of Endodontology. Int Endod J 2006;39:921-30. American Association of Endodontists. Guide to Clinical Endodontics. 4th ed. Chicago, IL: American Association of Endodontists; 2004. American Academy on Pediatric Dentistry Clinical Affairs Committee-Pulp Therapy subcommittee, American Academy on Pediatric Dentistry Council on Clinical Affairs. Guideline on pulp therapy for primary and young permanent teeth. Pediatr Dent 2008;30:170-4. Guidelines for Infection Control. Australian Dental Association. 3rd ed. St Leonards NSW 1590, Australia; 2015, p. 3, 22, 38. Filipovic J, Jukic S, Miletic I, Pavelic B, Malcic E, Anic E. Patient's attitude to rubber dam use. Acta Stomatol Croat 2004;38:319-22. Going RE, Sowinski VJ. Frequency of use of the rubber dam: A survey. J Am Dent Assoc 1967;75:158-66. Savani GM, Sabbah W, Sedgley CM, Whitten B. Current trends in endodontic treatment by general dental practitioners: Report of a United States National Survey. J Endod 2014;40:618-24. Koch M, Eriksson HG, Axelsson S, Tegelberg A. Effect of educational intervention on adoption of new endodontic technology by general dental practitioners: A questionnaire survey. Int Endod J 2009;42:313-21. Lin HC, Pai SF, Hsu YY, Chen CS, Kuo ML, Yang SF, et al. Use of rubber dams during root canal treatment in Taiwan. J Formos Med Assoc 2011;110:397-400. Lynch CD, McConnell RJ. Attitudes and use of rubber dam by Irish general dental practitioners. Int Endod J 2007;40:427-32. Gilbert GH, Riley JL, Eleazer PD, Benjamin PL, Funkhouser E, National Dental PBRN Collaborative Group, et al. Discordance between presumed standard of care and actual clinical practice: The example of rubber dam use during root canal treatment in the national dental practice-based research network. BMJ Open 2015;5:e009779. Stewardson DA, McHugh ES. Patients' attitudes to rubber dam. Int Endod J 2002;35:812-9. Kapitan M, Hodacova L, Jagelska J, Kaplan J, Ivancakova R, Sustova Z, et al. The attitude of Czech dental patients to the use of rubber dam. Health Expect 2015;18:1282-90. Ahmad IA. Rubber dam usage for endodontic treatment: A review. Int Endod J 2009;42:963-72. Hill EE, Rubel BS. Do dental educators need to improve their approach to teaching rubber dam use? J Dent Educ 2008;72:1177-81. Ahmed HM, Cohen S, Lévy G, Steier L, Bukiet F. Rubber dam application in endodontic practice: An update on critical educational and ethical dilemmas. Aust Dent J 2014;59:457-63.